Get the Indian Spicy food gravy recipe as Punjabi Chana Masala to change the taste of your tongue. This Chana masla recipe will surely steal your heart. 1. Wash the Chickpeas/Chana clearly and soak them overnight in water. 2. 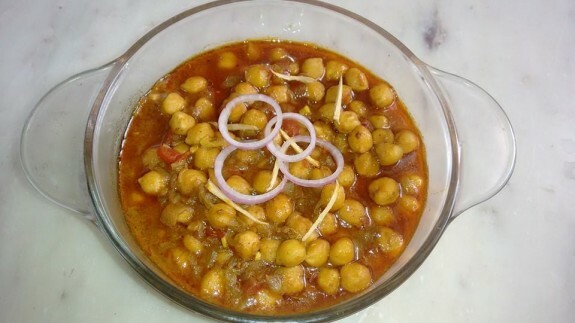 Boil the Chana with some salt, turmeric powder and baking powder with enough water in a pressure cooker or covered pan. It may take 20 mins to cook in cooker and 40-50 mins in pan. 1. In a blender mix ginger garlic paste, chopped tomatoes, dry red chilies, coriander seeds and blend it to make a smooth paste. 2. Heat oil in a pain and add the ground paste. If you want, you can keep tomato paste and ginger garlic paste in a different bowl and while cooking first you need to pour the ginger garlic paste and then after sauté for 2-3 mins, pour the tomato paste with other mixers in the pan. 3. Fry the masala paste for 5-6 mins till the raw smell of the tomato and ginger garlic paste disappear and oil leaves from the side of the masala. 4. Add green chilies and 1 cup warm water. Stir and cook for 3-4 mins. 5. Add boiled chana and mix it with the rest of the masala. 6. Let the chana masala cooked for 15-20 min in low flame. 7. Add garam masala powder and salt as per taste and cook for 1-2 mins more. 8. Garnish it with chopped coriander leaves and onion slices. 9. Serve it with poori, naan, bhature or steamed rice.